Fun times at Maida Vale Library! We hosted a couple of activities to amuse the local children during the half term break. On the Tuesday we had a monster mouth event to highlight with National Smile Month, all about dental hygiene. After a story about a dinosaur who eats too many sweets and ends up at the dentists, we made some lovely colourful monster hand puppets from felt. On the Thursday we had a dinosaur drawing workshop – there were some very weird and scary results. About 50 children plus their parents, turned up to the events. Thanks to Mina, our agency worker and our volunteer, Susan for all their help with the events. 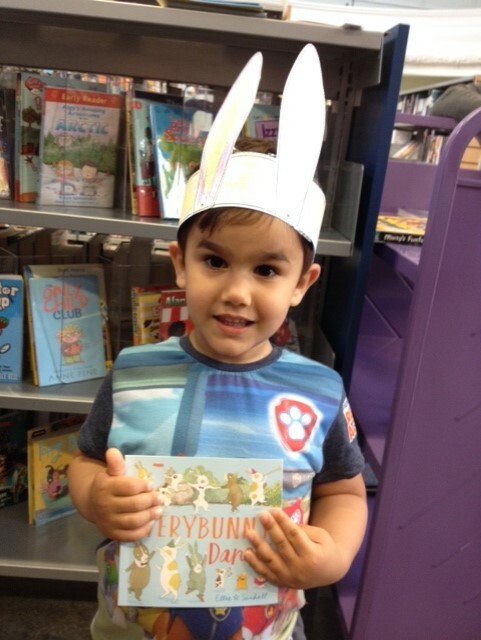 And this we had a very lively under 5s event where we celebrated National Bookstart Week – everyone got copies of ‘Everybunny Dance’ by Ellie Sandall. We read some bunny stories – “Where’s Peter Rabbit?”, and “Guess how much I love you” and the rhyme “Peter Rabbit had a fly upon his nose” and of course we played sleeping bunnies. After some major bunny hopping, the children made some bunny ears after colouring them in. Don’t worry if you missed out, we have lots of events in our libraries for all ages, hope to see you soon. This entry was posted in Children / Teens, Maida Vale Library and tagged craft, half term, National Bookstart Week, national smile month. Bookmark the permalink.